Largest Jewish organization in Russia hit in latest firebomb firebomb attack on Russian Jews. Unidentified individuals hurled a firebomb at the Moscow offices of the largest Jewish organization in Russia, which is adjacent to the Marina Roscha Synagogue. No one was hurt and minimal damage was caused in the incident Monday night at the offices of the Federation of Jewish Communities of Russia on Novosushchevskiy Street in north of the Russian capital, the online edition of the L’Chaim Jewish newspaper reported Wednesday. 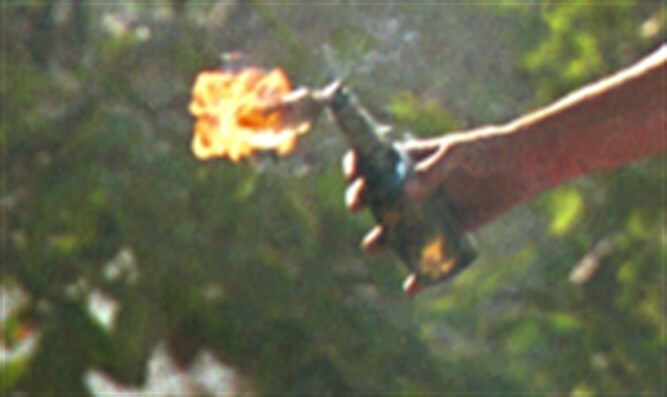 Footage from the incident shared by the Moscow Metropolitan Police with local media shows a person whose facial features are not clearly visible throwing the firebomb and leaving the scene as it bursts into flames. The Marina Roschina Synagogue complex, which is also the seat of Berel Lazar, one of Russia’s two chief rabbis and the head emissary of the Chabad movement to the former Soviet Union, has blast-proof windows and doors and is guarded by day by security personnel carrying automatic weapons. All visitors must pass through a metal detector. Last month, firebombs were hurled at the studio of a renowned Russian-Jewish film director who is reviled by some nationalists for his controversial depiction of the love affair between Russia’s last czar and a ballerina. The firebombs hit the windows of Alexei Uchitel’s studio in St. Petersburg on on August 30th, causing a fire that was extinguished before it could cause serious damage to the building, RIA Novosti reported. The blaze did not spread into the studio’s interior.